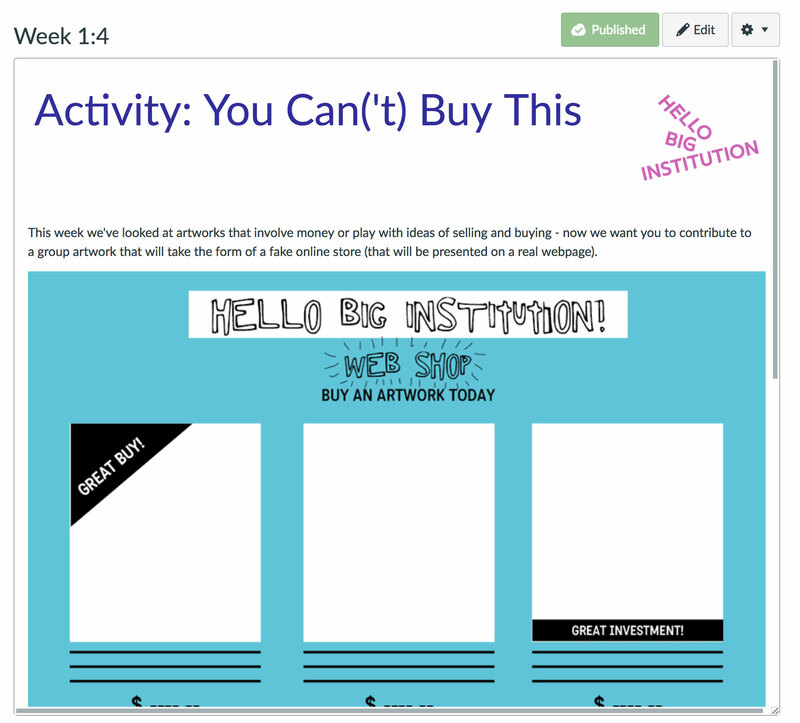 Hello Big Institution (HBI) was a free online course offered to students in high school anywhere in Australia, designed to extend interaction and engagement with offsite learning audiences. 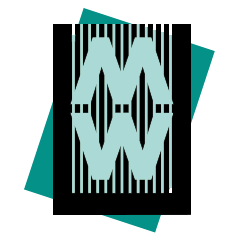 The course was created in collaboration with Australian artist Lara Thoms working in collaboration with the MCA Digital Learning team. The MCA has undertaken a range of projects and approaches that attempt to build engagement with students and teachers in remote and regional locations, the concept of an online course came from a desire to create an offering that allowed for an asynchronous model of engagement – something that had previously hampered our efforts when using 2 way video connections. The course was offered to students to enrol as individuals or teachers to enrol a entire class. 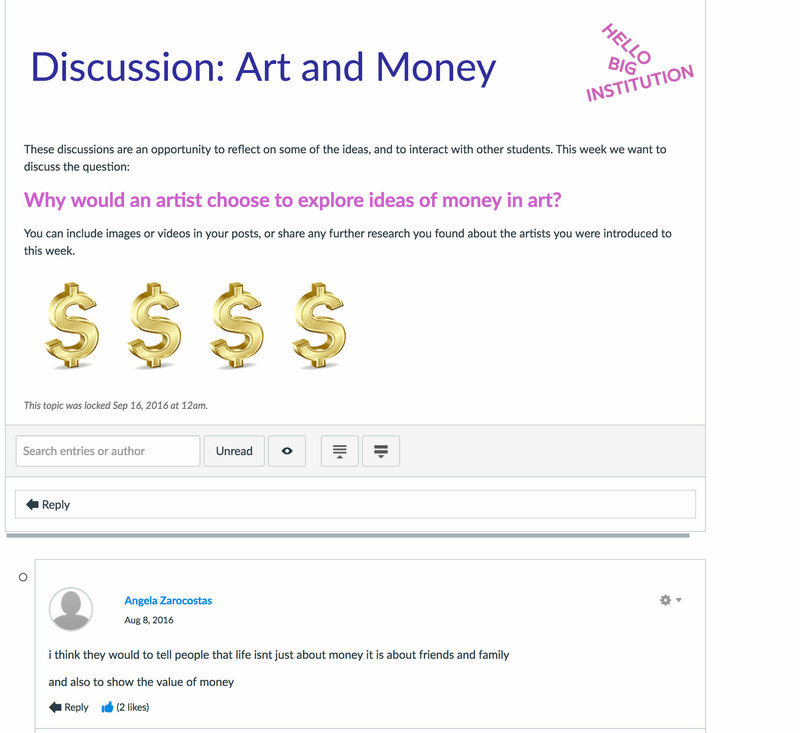 Consisting of 4 weeks plus an initial introduction week, each weekly segment consisted of a short video created with Lara, information and links to artists featured in the video, a discussion forum, a short quiz and short assignment designed to connect students to some of the ideas encountered. Lara took the lead role in directing the content of the course drawing upon her own practice and interest in artists that challenge institutional authority, operate outside of institutions or utilise unusual mediums including socially engaged and situationalist style strategies. We asked Lara to allow students to see the art world through her eyes, challenging them to rethink what contemporary art can be. The MCA Digital Learning team (Alex White; Digital Learning Producer and Stephanie Lade; Assistant Digital Learning Producer) worked to implement Lara ideas into an accessible and compelling format using a learning management software; Canvas. Students could login and move through the content at their own pace or work together in class time led by a teacher. Utilising illustration to break up the appearance of each page of the course and light hearted open questions and quiz sections to encourage student engagement. The production of a seperate video for each week allowed us to introduce the artist practices in Lara’s own words, students could then go on to further research each artist independently. 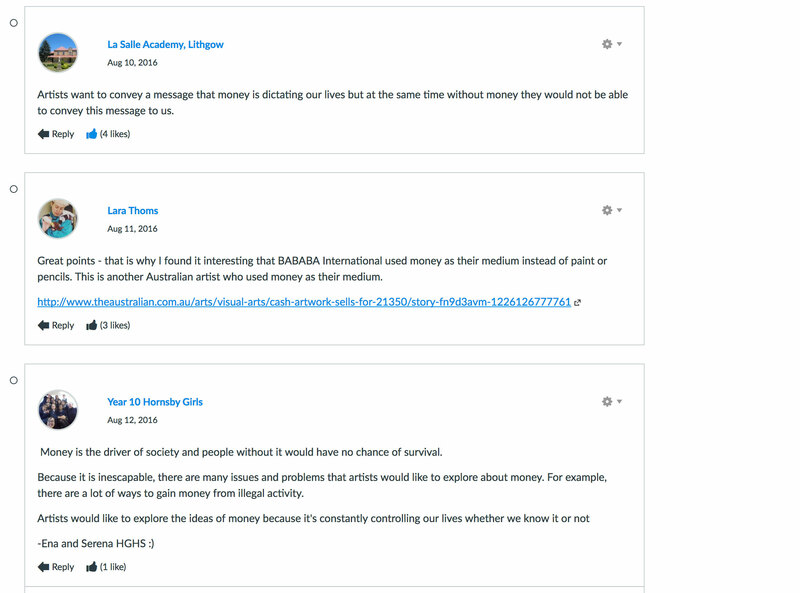 In the discussion forums each week Lara and MCA staff actively participated – responding to students contributions and encouraging further active research by students. Individual students: 10/21 individual students completed the course. 7 students completed the course. 3 students participated but did not complete every element of the course. 4 students signed up but didn’t participate. 3 students never accepted their invitation. Classes: 10/15 classes completed the course. 10 Classes completed the course. 3 Classes had minimal interaction. 1 teacher only viewed week 0 and 1 of the course – no interaction. 1 teacher never accepted their invitation. 5 out of 8 respondents to our survey indicated gave the course a 5/5 score, 2 teachers gave it a 4/4 and one gave it a 1/4. 8 out of 11 students who responded to the quiz in the final week indicated they either enjoyed the experience very much. 3 responded that it was OK. All students who responded would recommend the experience to a friend and most students felt their ideas about art had changed. Finding out about new artists, being challenged by new art and connecting to Lara’s practice were rated as being the most valuable aspects of the course. We have found this first attempt offer to offsite students a deeper engagement with artists and our schools engagement team to be highly successful. We are now rebuilding the course to take on ideas and improvement suggested by students and teachers. One major learning for us was that the needs of an individual student operating independently of school are very different to that of a teacher leading a class, in 2017 we will be offering the course separately to these two audiences. To our knowledge this is the first artist lead online course offered to high school students. 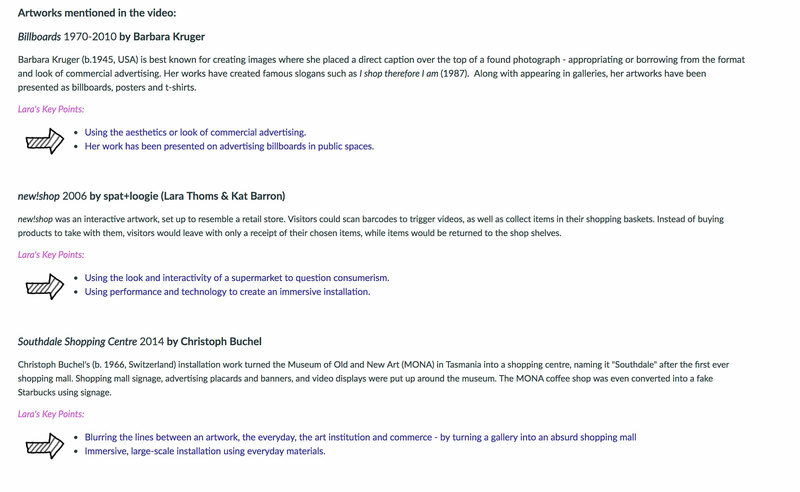 Created by Australian artist Lara Thoms, it allows participants to engage directly with Lara and the MCA Learning team. The course runs over a four-week period, during which artist Lara Thoms and her past collaborator Kevin Duo Jin explore artist practices that work outside and around gallery spaces – engaging with the people, power, and place(s) that they are situated in. Many of the ideas presented in the course relate to unusual art practices that might be situated outside of a gallery space or directly consider their relationship to an art institution. In 2017 we are presenting two versions of HBI – one designed for students to engage with as a class, in class time and led by a teacher and the other designed for individual students to do in in a self led approach.